Miles: 8.1 miles (13km), from Clouds Lake to Echo Summit Trailhead. Health: Town day, feeling awesome. I woke up to the sound of Iced Tea packing his gear and leaving camp. I have been seeing him on and off since Sierra. We hike completely different rhythms: he wakes up and gets to camp early whereas I hate early mornings and enjoy hiking well into the darkness. This means we usually see each other while passing the other one having lunch. And early evening when he’s setting up camp. A quick look at my watch and it’s 4-something-am, way too early for me to get out of my warm down haven. I quickly fall back to sleep. Little later, after battling with the alarm for about a half an hour, I finally wake up. To my surprise, there’s a strong smell of smoke. Is someone having a bonfire this early in the morning? Or is there a wildfire close by? I get up and walk up to where Reroute and White Rabbit were camping. The air is smoky but I can’t see any flames. Must be winds pushing smoke from the wildfires towards us. We eat breakfast together and Reroute leaves soon, White Rabbit short time after her. We all agree to meet at the trailhead to go to South Lake Tahoe together. It’s interesting to get to Tahoe as I’ve been in talks over email with Anthony, a trail angel from South Lake Tahoe. He sent me an email and said if we get to Tahoe when he’s there, he and his wife would like to arrange trail-magic for us. I messaged him when we left Sonora Pass to let him know our estimated arrival to South Lake Tahoe. Since the trail had been faster than we thought, I sent him an update yesterday saying we’d be at the Echo Summit trailhead a day earlier than we estimated. As I haven’t had reception since yesterday I don’t know if Anthony received my email or if he’d be able to make it to the trailhead a day earlier. Right after leaving Clouds Lake and our camp spot, I can’t seem to find the trail. I know the direction it should lead to, but can’t see the actual trail anywhere. After hiking a while towards the general direction of where I think the trail should be heading, I find it. As the views are blocked by the smoke, and since we only have about 8 miles to the Echo Summit trailhead, I put my head down and cruise while listening to music. The trail crosses multiple snowbanks and I’m again reminded of how frustrating trail finding in snow is. After a rather large batch of snow, I pick up the trail again and keep on hiking. Little later something feels off. I’ve been climbing for a long time but the trail is supposed to be heading down, not up. As I keep climbing the trail keeps getting steeper and steeper. I take out my phone to check Guthooks to see what’s going on. As the GPS finds my location I see I’m about a mile off, going up on a wrong trail, to the opposite direction and away from South Lake Tahoe. I must have missed a junction on that last snow batch and headed down the wrong trail. Instead of backtracking, I decided to bushwhack my way back to the trail. I find a steep hill and after half an hour of bushwhacking, I’m back on the PCT. That episode cost me about an hour so I need to speed up. Going downhill I’m moving faster but there’s no way to catch up to the lost hour on such a short distance. Finally, I reach the Echo Summit trailhead and see a car with a bunch of hikers around it. Among the hikers, I see Reroute and White Rabbit. There’s a couple giving out trail magic. Could this be Anthony and Annie? As we’ve only talked over email, I have no idea what they look like. As I get to the car I hear “Hey Isko, we’ve been waiting for you!”. It is Anthony and Annie. They’ve brought their two doggies and enough Starbucks coffee and breakfast burritos to feed an army of hikers. How awesome! Annie hands me a bacon burrito, my favorite, and Anthony and I start talking. Heading down towards the trailhead. 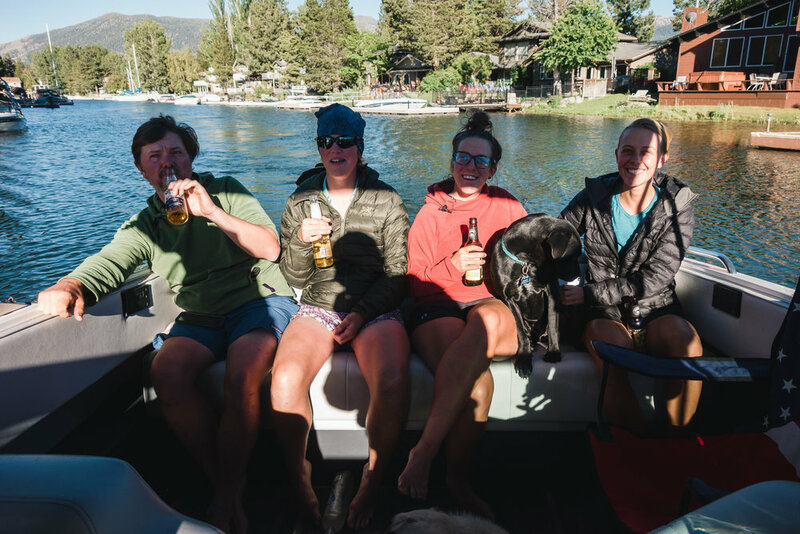 Anthony tells me that he’d like to invite us to their house at Tahoe Keys for barbecue, showers, hot tub, laundry, resupply, post office runs, and wakeboarding on the lake. My jaw drops. When he messaged me saying he’d like to give us trail magic, I was thinking something like ice cold sodas and beer at the trailhead, and maybe a ride to town. But all this? I’m speechless. I look at Reroute and White Rabbit and we happily accept the awesome offer. 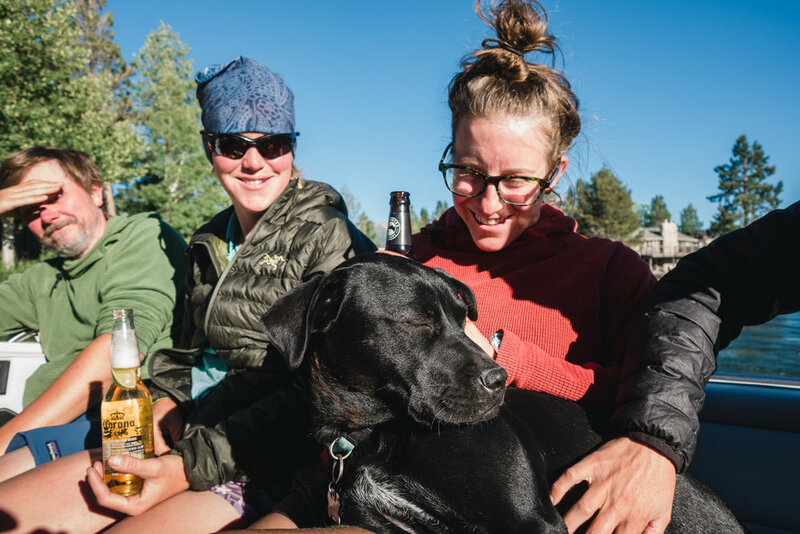 After handing out coffee and burritos to more hungry hikers, Reroute, White Rabbit, and I hop in their car and start heading towards South Lake Tahoe. On the way, we hear that since we had arrived a day earlier than originally planned, Anthony and Annie had to change their plans to meet us and skip an NBA game. They had arrived at the trailhead the previous night and slept in their car waiting for us. We are blown away by their kindness and generosity. After running some chores in town we arrive at Anthony and Annie's house and things get even more amazing. The house is absolutely beautiful, sitting on a canal, just a short distance from South Lake Tahoe. Anthony shows us where we can leave our dirty clothes for washing while Annie brings us loaner clothes to wear. After a quick tour of the house and the yard, Annie asks us if we’re hungry and what we’d like to eat. As we’ve only had hiker food since Sonora Pass, we’re up for anything that isn’t cold soaked or bars. When Anthony asks if we’d like to have BBQ tonight we just nod with our mouths open. I love barbecue and it’s one of the things I seem to miss the most on the trail. After Reroute, White Rabbit, and I have finished showering, Annie comes back from the store with a car full of food. As there’s only three of us, Anthony asks if we have more friends in town who’d want to join us for the BBQ. I’ve messaged with Storyteller and Cannonball earlier and knew they were in town so I send them a message to ask if they’d like to join us. They quickly agree and Anthony and I drive to pick them up from their hostel. Look at all this non-hiker food! Once back at the house we fill our bellies with sandwiches, BBQ, and beers while playing games. It’s hard to describe how good it feels to be in a big house, having clean clothes, having showered, eating well, and just relaxing. While in the “normal” life you take all these things for granted, after spending months on the trail, this feels like heaven. And while we are guests, and have just met Anthony and Annie, they make us feel right at home. It’s funny how quickly you can go from being complete strangers to feeling like you’ve known each other for a long time. Anthony and Annie introduce us to Liar's dice, a game I’ve never played before but quickly fall in love with. 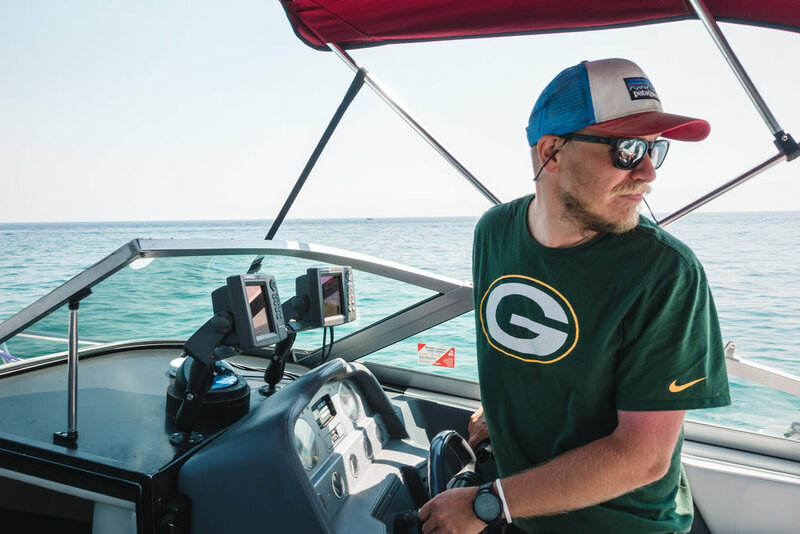 After many rounds of dice, Anthony takes us all for a boat ride around the lake. The weather is nice and clear and there’s no sight of the smoke we saw earlier in the morning. 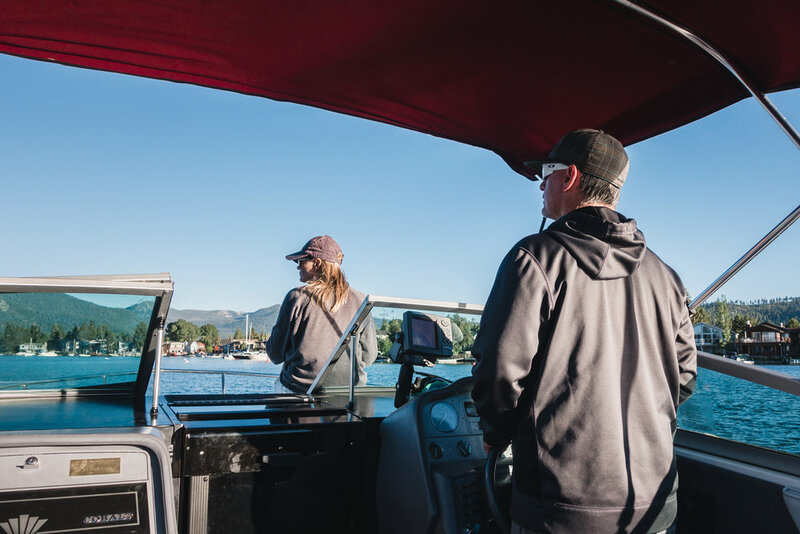 We cruise around the lake as the sun sets, stopping over at the Emerald Bay to enjoy the spectacular views. Going out on the lake. Enjoying being on the boat. We head back to the house and after few more rounds of beer, food, and Liar’s Dice, we’re all pretty tuckered. Anthony shows us our beds and we make plans to head out in the morning for early morning wakeboarding sessions. Going from the monotony of hiking, to this, feels like a sensory overload. I’m smiling from ear to ear. The next morning I wake up to the smell of breakfast. Annie and Anthony are in the kitchen making us pancakes, bacon, and fresh fruits. Sadly White Rabbit and Reroute can’t stay longer as White Rabbit needs to get to a wedding and has to get back on the trail. Anthony gives them a ride back to the trailhead while Cannonball, Storyteller, and I enjoy not having anywhere to rush to. Today is definitely going to be a zero! Once Anthony gets back we all hop on the boat and head out to the lake. It’s still early enough that there are no waves – perfect weather for wakeboarding. But unlike yesterday, the air is now covered in so much smoke that you can barely see the mountains around the lake. As Cannonball and Storyteller have never wakeboarded before, I’m the first one in the water. I can’t remember the last time I had been on a wakeboard. All I remember was that it ended with a really bad whiplash as my jump fell short and I caught the wave with the heel edge of the board. Not wanting to end my hike due to wakeboarding injury I keep repeating “DO NOT TRY ANY JUMPS” in my head as I get into the water. I get pulled few laps and it’s as much fun as I remembered it to be. I’m definitely rusty and falling few times quickly remind me how hard the water is. But this is definitely fun! Then it’s time for the girls. They’ve never been on a wakeboard so Anthony gives them a crash course in “Wakeboarding 101”. I’m not sure if it’s the crash course or the talent of the girls, but they both get up pretty much on their first pulls, something I’ve never seen before. Two badass hikers who just learned how to wakeboard on the PCT. We do few more laps around the lake and I pull Anthony for a short while. He’s clearly been on a wakeboard before. But as the morning changes to midday, the waves appear and we all decide it’s time for something else. Anthony and Annie show us a cool spot to have some post-wakeboarding drinks and we drive to a place called Chambers Landing. 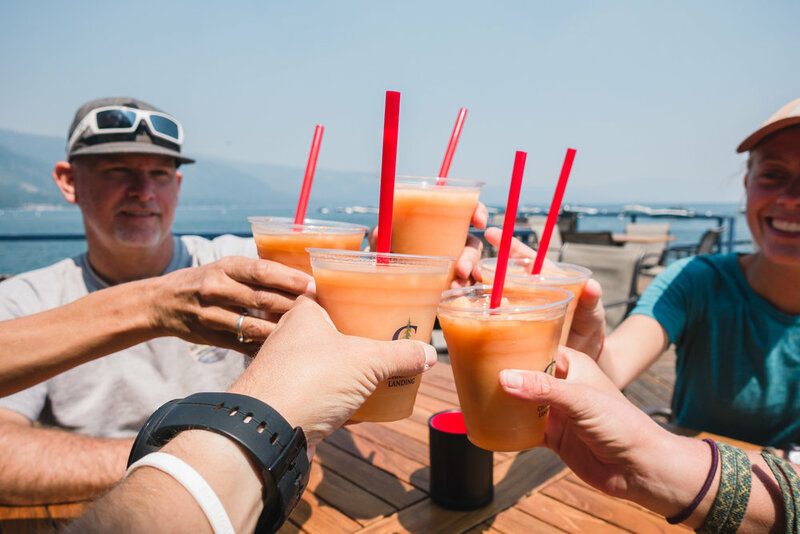 We learn that it’s one of the oldest taverns on the lake and that their signature drink is absolutely delicious. We enjoy more rounds of Liar’s Dice on the deck while sipping ice cold drinks. All this feels like the furthest thing from thru-hiking and I feel so relaxed. I have mentioned few times on trail that I’d love to do cliff jumping and Anthony tells me about a spot not far where I could do just that. After few more rounds of drinks and dice, we get back on the boat and drive to a rock face close by. It’s not very high, and there’s not much of a platform to get speed, but at this point, I’m just glad to have water and somewhere to jump from. We anchor the boat as close to the rocks as we can and I jump in the water and swim the short distance to the rocks. With Anthony’s instructions, I try to find the spot to climb up from and soon I’m as high as I can climb. There’s no take-off so I just have to push myself off the rocks to get some clearance. The drop is not high, maybe 13-14 feet (4m), and without take-off, there’s not a lot of tricks I can do, so I go with the standard belly-first jump. After hitting the water I know I need to go for another round. The girls also decide to join and they swim up to the rocks. We all climb up and they jump first without any hesitation. I do one more jump and then we all swim back to the boat. On the way back to the house we eat sandwiches Annie made us and drink few more beers. If someone would ask me to describe my perfect summer day, this would be pretty much spot-on! Back at the house, I notice my shoulder starting to hurt a little. I felt it being pulled and dislocated a bit while I was wakeboarding and hit a small bump but it didn’t feel bad at all at the time. Both of my shoulders are pretty bad and dislocating them is nothing new. For the evening we decide that we’d all like to eat some sushi so we head out to town. While we’re eating and having fun, I stop and look around me. I’m thousands of miles from home, in a foreign country, surrounded by friends I didn’t even know a few months ago, laughing and having the time of my life. I keep thinking of all the small decisions we’ve all made to end up here, at this exact moment, and how perfectly it all has happened. The next morning Cannonball and Storyteller want to get back on the trail while I decide to stay in South Lake Tahoe for one more night. We’ve had so much fun that I haven’t had any time to work on my site. Anthony and Annie are also leaving town today. We say our goodbyes at the house and take few photos. Anthony and I give the girls ride back to the trailhead. On the way, we stop at the post office to ship our ice axes back home. There’s no need for them anymore. While we’re driving back Cannonball calls me to tell me she accidentally took my wind jacket. They hide it behind a rock at the trailhead and send me extremely detailed instructions for finding it. Anthony drops me at the Motel 6 where I had reserved a room for the night and we say goodbyes. While the upside of the trail is that you get to meet a lot of awesome people, the downside is you often can’t spend enough time with them as you have to keep moving. At the motel, I find out my room is not ready yet, so I walk along the main road to the Taco Bell to drink a milkshake and enjoy the air conditioner. It’s really hot outside and I don’t want to just sit in the sun waiting for my room to get ready. Finally, my room is ready. As we’ve been just moving all the time, I hop on the bed and switch on the TV to enjoy the “not doing anything” for a while. The next thing I know is I wake up and it’s dark outside. I’ve fallen asleep and slept the entire day. The first thing I notice is that I’m starving and the only place still open is a pizza place about 20 minute walk down the main road. Once back at the motel I finish the entire large pizza on one go and hop back to bed. I wake up and it’s morning. What just happened? Apparently, I needed to catch up on my sleep. The plan of working on my site fell through but at least I’m well rested now. The plan for today is to do a quick resupply and then get a ride back to the trailhead. I call the reception to ask for a late checkout and then run across the main road to the grocery store for a resupply. The selection isn’t the best but as I’m on foot and the better stores are miles away, I have to make due with what they have. Back at the motel, I pack my pack and checkout. I’m hungry again so before starting to hitch, I do a quick stop at the Taco Bell. Not my favorite fast food restaurant but sadly the only quick and cheap one within walking distance. After filling myself with “food” I head out to the side of the main road to try to get a hitch. It’s hot and while I try to do my best to not look homeless, I have no luck getting a ride. I walk down the main road few times trying to find a better spot but again no luck. As I’m about to give up I get a message from Sunshine and others saying they’re on their way down from the trailhead. As I haven’t seen them for a while, I send them a message and we soon meet up in the Enterprise car rental shop down the road. It’s so good to see everyone again. There’s Sunshine, Dandy, Fireant, Kendall, and Roadrunner and they quickly convince me to stay in town for a little longer. I agree to join them for an all-you-can-eat sushi lunch if they give me a ride to the trailhead later. We head to the sushi place and catch up on all the trail news. They tell me Fyre quit the trail in Bishop when we left her at the hotel. I had no idea and didn’t even get to say proper goodbyes. For the next two hours, we all eat way too much sushi. On the trail, ever since Casa De Luna, we’ve had this habit of playing or singing Phil Collins’ “One More Night” when some of us wanted to stay instead of getting back on the trail. This time the girls use the song to talk me out of getting back on the trail and instead stay for one more night. It doesn’t take a lot of convincing and we are soon trying to find a motel room big enough for all of us. Before that, we drop Kendall off as she’s spending the night with her mother who’s in town to see her. After way too much back and forth we find a massive family room that fits us all nicely. Later we go out for some shopping and sightseeing around the South Lake Tahoe downtown. We buy way too much food and head back to the motel, eat, and eventually, I fall asleep sharing the bed with Roadrunner. It’s good seeing everyone again!